One of the greatest delights is growing ones own food. Every gardener's growing season is different and has individual start and end times. A good cold frame can increase the amount of time you have to grow your own food and act as an insulator for lightly sensitive plants that might not survive winter without some protection. 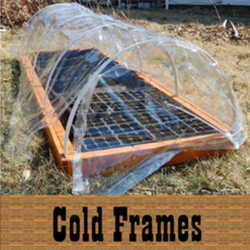 Think of a cold frame as a miniature greenhouse that is unheated, except by natural solar energy. These easy to build structures are useful at the end of the season to help protect plants as cold weather intrudes and as a jump start in spring to hold and begin to harden off early starts. If you just can't say goodbye to summer and you love the taste of home-grown produce, cold frames step in to extend the season. 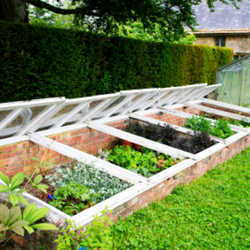 Cold frames have many uses and may be made to disassemble easily in summer when planting space is at a premium or may be made as permanent structures to grow in year around. Among the many uses for a cold frame is to overwinter dormant or frost tender plants. They are also useful as seed germinators early in the spring, and they can be helpful in hardening off previously started seedlings to get them ready to go in the ground. Just remember that plants need air occasionally and that the temperatures can double inside a closed frame. Venting daily is usually required even in temperatures of 32°F. Materials for a cold frame can be purchased, or you may use recycled items. 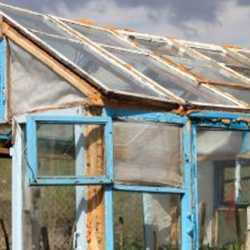 Old windows in their frames, scrap wood, and even a discarded cabinet can all be used to make a cold frame. You can simply use an old wooden crate with a piece of glass laid, on top or you can build a cold frame with hinged glass and decorative touches. Even PVC hoops set over rebar and covered with thick plastic will do the trick, but it is not as durable as using glass. An in-ground cinder block structure or hay bail cold frame are additional options. The choice is up to you. The size will depend upon how ambitious your off-season garden will be and what size plants will inhabit the frame. Some gardeners dig their frames into the soil to add even more insulated protection, but this isn't necessary. Frames may be built on top of the ground just as easily and will function just as well. The main idea is to create a housing unit that will keep out some cold, collect solar energy and heat during the day, and most importantly, provide easy access and ventilation. What can you grow in a cold frame? The most common winter produce are the hardy greens like mache and spinach, but arugula and many other salad greens can also thrive. Any fall vegetables can be grown in the frame as well as herbs that may not be winter hardy. Fall plants to try might be root vegetables like radishes, carrots, and leeks. Spring produce runs the gamut. Even larger plants can be started in the frame and planted out later, or you can remove the lid as they grow to let them go wild when temperatures warm up. A super easy cold frame to build is a cinder block structure. If you aren't handy with measuring, cutting, and assembling, this frame couldn't be easier. Dig out soil to a depth of at least 12 inches on one side, and double that measurement on the other side. The alternate sides should be dug so that the walls will slope but the base is flat for planting. Slant the alternate walls in a southward direction to capture solar energy. Leave a wall of soil around the depression, and either use a rectangle or square shape to make installation easier. The size is up to you. Use cinder blocks to line the walls of the hole. These will shore up the earthen walls and make a nice base for the frame. Now all you need is an old window, heavy duty plastic, or double panel polycarbonate. You now have a cheap, easy cold frame that just took a little digging. A more permanent structure can be created with scrap or purchased wood. Start by selecting a lid. It can be polycarbonate or glass. The size of the lid will dictate the size of the frame. You may also choose to make your own lid out of thick greenhouse plastic stapled to a wooden frame. Once you have your lid dimensions, it is time to cut your wood. If you want the frame to last, purchase treated wood with SPF protection such as decking lumber. Avoid pressure-treated wood, as it can leech toxins into the soil and contaminate your food. The exact quantity of lumber will depend on the dimension of your lid. You will need wider pieces at the back to create a sloped effect toward the sun. Use elbow braces at the corners, screwed in and sealed. If you wish to, you can reinforce the corners with vertical posts. Use sealant or caulk at all the joints so that the interior doesn't flood when it rains heavily. You may choose to insulate the box next. Use foam insulation board or styrofoam on the interior of the box. Then attach the lid with heavy duty door hinges. This will make it easy to open. You will need to ventilate a little bit, so keep a short post or stick nearby. This is an easy project for even a novice tool user and will last for years with very little maintenance. A cold frame is useful in all seasons and a worthy investment of time and a little bit of money.